The administrator may select here if he would like to use MAPI protocol to communicate with the Exchange server. EWS (Exchange Web Services) connection is selected by default if MAPI is not selected here. It is important to know, that O365 Exchange server does not support MAPI connection. Another requirement to use MAPI is to have Exchange server 2013 or earlier version. Since some other functions might still use EWS, the EWS connection must be configured in any case. By checking Split attachments option, the attachment will be stored separately from the email body. By default, this (recommended) option is always turned on. In this use case, we will use EWS and we will split the attachments, too. The Use journal archive to build folder structures of mailboxes option will allow the job to update the folder IDs and create the correct folder structure. The job goes trough a mailbox, searches for the email in the archive and updates its folder ID (creates also the folder in the archive if it hasn’t existed yet). Read more about journal processing here. If you check the Archive email if journal didn’t archive it yet sub-option, the archive job will also archive the email if it was not yet archived using the journal processing. Read more about journal processing here. Note: At least one mailbox must be set as Process as journal mailbox from its context menu in the Address book, otherwise the Use journal archive to build folder structures of mailboxes and Archive email if journal didn’t archive it yet options won’t appear in the job’s configuration. Note: The Split attachments option is active (checked) by default. That means that the body of the email and the attachment are stored separately. If the email message containing attachments has been archived by a job, where this option was not checked, our apps (MailApp, officeGATE, contentACCESS Mobile) will show 0 attachments. However, if you open the original email, the attachments are shown. If this option was checked, but the email was containing embedded email (.msg attachment), this embedded email won’t be displayed between the attachments in our apps. In the mailbox, the emails will be replaced by the shortcut that is set in the “Apply to NOT ARCHIVED items” section. You can use any previously configured shortcut type that was configured in section Shortcut configuration above. If the mailbox items have not been archived yet (are archived for the 1st time), check the “Apply to NOT ARCHIVED items” checkbox. It is recommended to use HTML shortcut for emails/attachments that are 1 to 2 years old. Note: If the items are already archived (e.g. with the “Keep original” method), but they need to be replaced with shortcuts, check the second checkbox and specify a previously configured shortcut type that should be used. It should be mentioned that these 2 processes will always run in 2 stages (even if both processes are configured within one job). By the 1st run of the job the items will be archived, by the 2nd run of the job the (archived) items will be replaced by the selected shortcuts. You can also set the age and size filter for the emails to be archived. For Age filter and Size filter settings click on the corresponding “Change” button and set the age of the emails that should be archived and the size of the items to be archived. The maximum size that can be set is 1024, and the available size units are: KB, MB, GB, TB. It is important to keep in mind that the sent date of the emails is the determinative date in case of the age filtering. Note: Email archive size filter is limited to 2 GB (gigabytes). Size filter uses the message size aquired from EWS (Exchange web service). 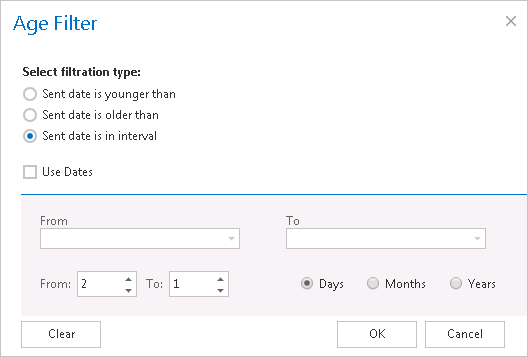 This message size can be different from the value displayed in Outlook. In this use case, we will process all emails, regardless of the file size, so we set the value to “0”. Note: Shortcutting methods can be also combined when configuring an Email Archive job. For more information refer to section “Combining the shortcutting methods”. In this use case, we would like to archive emails older than 1 year and replace them with a shortcut. We are configuring the option “Apply to NOT ARCHIVED items” only. The mails will be archived and immediately replaced by a shortcut. In this use case, we will configure the archiving job to archive all emails (regardless of age) with the shortcut type Keep original. This will ensure that all emails are archived, but the mailbox is kept intact. Emails older than 3 months will be further processed – after these are archived, they will be converted to HTML shortcuts. Note: By using a “Journal shortcut” type you can delete the shortcuts completely from the mailbox. Note: It is possible to archive journal mailboxes as well. Just select this option in the Mailbox selection window and in the “Include folders” configuration section set %INBOX%. When a journal message is exported to PST, the inner message is exported. Email archive job is crawling the entire mailbox or recursive folder structures from the mailbox for further processing. Before you enter the folder name(s) to be crawled, it is necessary to select the folder filtering type. If you set Entire mailbox, then the whole mailbox including all folders will be processed. If you set One single folder type, then only one pre-selected folder will be processed (e.g. if you set %INBOX%\Subfolder1, then only Subfolder1 will be processed). If you set Recursive, starting from a single folder filtering type, then all folders starting from the defined folder will be processed (e.g. if you set %INBOX%\Subfolder1, then starting from Subfolder1, every subfolder will be processed in the structure). The same rule applies to the Multiple folders, and to the Multiple recursive, starting from a single folder, too, but in this case we can work with more folders simultaneously (e.g. : %INBOX%, %OUTBOX%\Folder name 5…or…%TASKS%, %CALENDARS%\Folder name 6). Important: It is highly recommended to specify the root mailbox folders using wildcards (%). Wildcards ensure that the given mailbox folder (e.g. the “INBOX” folder) will be processed, regardless of the language settings of the mailbox. This is important mainly for companies who archive mailboxes using different languages. 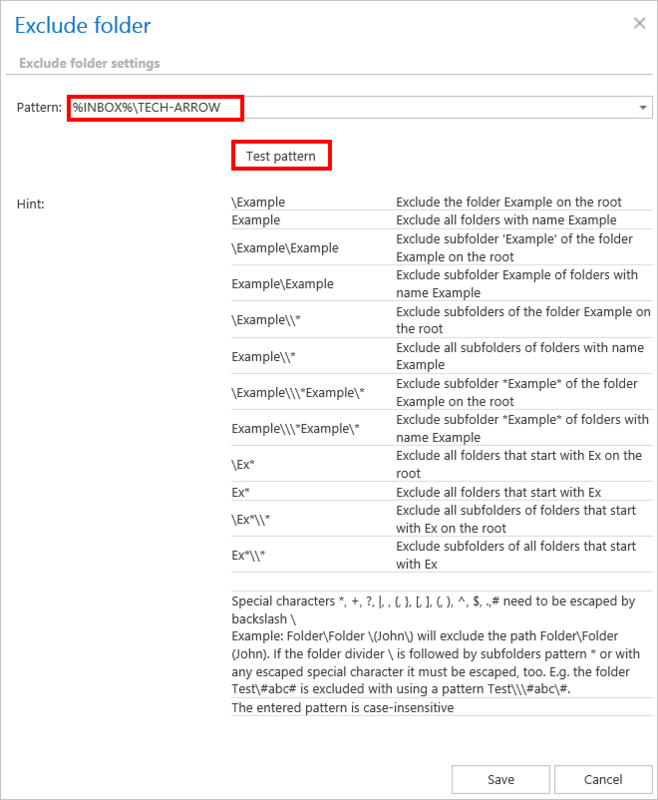 Subfolders must be added to a root folder with a backslash (\). With this function, you may set which folders/subfolders should not be archived. If you would not like to exclude any folder from the archive process, you can skip these settings. The folders may be excluded using one of the available methods: a) They may be added manually via the + new option; b) they may be imported in one of the available file formats via the import option. Important: Due to different language settings in the user mailboxes, it is highly recommended to specify the root folders using wildcards (%). Subfolders must be added to a root folder with a backslash (\). Click on + new option. In the Exclude folder dialog’s textbox specify the folder(s) to be excluded. Use the hints that are featured in the same dialog. %INBOX%\TECH-ARROW pattern on the picture below means that “TECH-ARROW” folder on the “INBOX” root folder will be excluded. This button is used to check if the entered pattern will be suitable for the path that the user would like to exclude from the archiving process. Open the Test pattern matching window by clicking on the Test pattern button. Enter the folder path into the Folder path field (this time without the % sign) and click on Test button.The test will be successful if the Pattern was entered correctly into the Exclude folder window. The list of folders to be excluded may be imported from files in one of the available formats: CSV, XML, Tab delimited files or Space delimited file. The file to be imported must contain the list of the folders. Important: Root folders must be specified in wildcards (%) in the import files. Subfolders must be added to a root folder with a backslash (\). To import such a file with the list of folders refer to chapter Importing contentACCESS configurations from files of this guide. The folders containing special characters like brackets, hyphens, question marks etc. can be excluded from the archiving process. 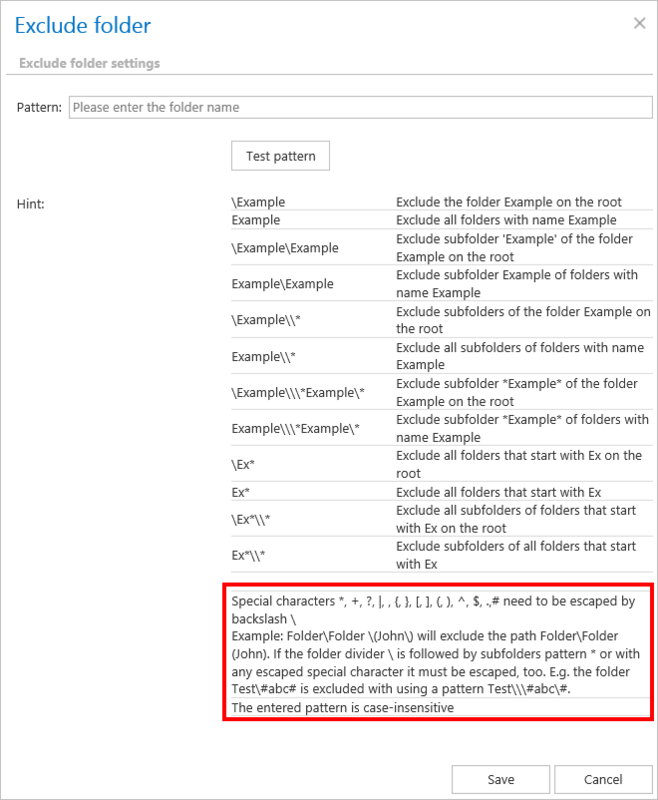 To exclude such folders from the archiving process, the special characters included in the folder(s) name must be excluded using the backslash “\” escape character. The escape character must be added before the special character to be excluded, in the Exclude settings of the archive job’s configuration page. This configuration enables filtering among your items by their message class. Using this filter, the user will be allowed to select different document types, such as mails, documents, contacts etc. to archive. Note: The message classes excluded in the Email archive System settings take always priority over the Item filtering settings defined in the archive job. Important: In case of custom Exchange solution(s) used for emails, the custom email properties will not be archived! The recommended solution: do not archive these emails and/or use the exclude feature (in Email archive System settings) for these custom message classes. 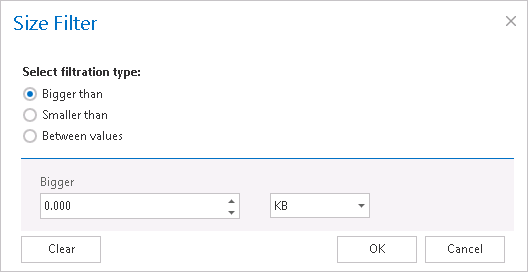 To set message class filters in the archive job, activate the Message class filter button by checking the checkbox next to it, then click on the active button. domains (e.g. @microsoft.com) from the list of archivable messages. Added to contentACCESS manually using the +new option; Click on +new to open the Exclude address dialog. Enter the object to be excluded and select the Exclude type (Sender, Recipient, All) to be applied. Imported into contentACCESS from a file using the import option. The file to be imported usually contains 2 columns: first column with the email addresses (or domains), 2nd column with the information if the object is sender, recipient or can be both. A sample import file may be viewed using the “Download sample” button. (For more information refer to chapter Importing contentACCESS configurations from files). Select here, when you will need to get notification emails from the Email archive job. It is possible to set here if you need such a notification email always/never, or you need it only in case that an error/warning occurred during the archiving process − for example, if the archiving of one or more items failed, then you may get a notification email about this error. Into the Recipient list textbox insert the email address(es) of the person(s), who will get such notifications. Notifications should be used if the administrator does not use the monitoring feature. Set the value, which will determine how many items will be processed simultaneously by the email archive job. The recommended value is “2”. What are the advantages of combining the shortcutting methods for the user? Companies use the “Keep original” archiving method on a daily basis. This archiving method ensures that the emails and their attachments are ready at hand during the time when they are still in use. After certain time period (usually after 6 months), it is pointless to keep these emails in the mailbox(es), as they take up too much space. However, these emails must be still easily accessible at any time. For this reason, it is recommended to replace them with shortcuts, which save space in the mailboxes and guarantee easy access to the older mailbox items. By combining the shortcut methods the end user will easily achieve the desired result. This use case will demonstrate how to configure an Email Archiving job, which will archive the items older than 10 days, while keeping them in the original file location. The job will also replace these items with shortcuts after 6 months. The job combines the “Keep original” archiving method with the shortcutting after the item reaches a certain age (6 months in this use case). The size of the items to be archived and shortcutted can be set as well. Note: If two archive processes are combined (as in this use case), then the archive process will run in two stages, too. By the first job running the emails will be archived while keeping the original, by the 2nd job running these items will be replaced by shortcuts. ✓ Set up a new Email Archiving job and open its configuration page. ✓ Set all required sections on the job’s configuration page. ✓ On the configuration page of the Email Archiving job navigate to the “Shortcutting” section and check the “Apply to NOT ARCHIVED items” checkbox. ✓ Set the “Keep original” archive method for items that are older than 10 days. Choose the “Keep original” option from the dropdown menu and set that all items older than 10 days will be archived. ✓ Apply the shortcutting to the items archived with the “Keep original” method, which are older than 6 months and larger than 100 kB. Choose HTML shortcut type, which will be used by the job. Check the “Apply to ALREADY ARCHIVED items with keep original shortcutting method” checkbox. Choose the already configured “HTML” shortcut from the dropdown list. Set the sent date to 6 months and the size to “larger than 100 kB”. Note: Please keep in mind that the sent date of the email is the determinative date. The age and size of the emails to be archived/shortcutted can be modified anytime by using the “Change” buttons. USE CASE: How to set up the shortcutting if all items should be archived and items under 100 kB should be kept in the original location, while items over 100 kB should be replaced by shortcuts? In this use case set the size filter in the 2nd!!!! row only (refer to screenshot above) to >100 kB and do not set a size filter in the 1st row. ✓ Save your settings and wait until the job starts to run according to the configured scheduler.